Stewart's characterization of the fragrance as light and clean, though, didn't seem to jive with Ghesquière's strange garden, and in the end, it's Stewart who is closer to the mark. The fragrance, developed by Polge with perfumer Jean-Christophe Hérault, is not so very strange or dangerous. The opening is sharp citrus tinged with green; it slowly turns minty and herbal, but that stage is short-lived. It's more floral as it settles (the notes: mint, rose, carnation, caladium leaf, vetiver and amber). The rose and carnation (with the heavier focus on the "rose") are done in a modern, shampoo-ish blended-floral style several steps removed from the actual flowers, and ought not to turn off young consumers wary of smelling like their mothers or grandmothers. Although the floral notes are strong in the early stages, Florabotanica dries down into a relatively sheer, slightly spicy floral musk, marginally powdery, mostly clean but not laundry-soap-clean, and reasonably office-friendly. I did not love Florabotanica, in fact, I didn't have any strong feelings about it either way. It doesn't have as much personality as its packaging, but it's hardly the first in that line, and while it did not smell particularly youthful to me, yes, it does lack the understated elegance of the original Balenciaga Paris fragrance; I'm guessing it will not attract as many perfumistas. 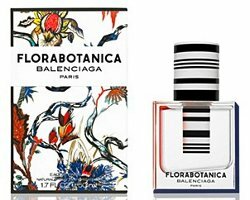 Florabotanica didn't annoy me as much as some similar recent "modern rose" fragrances, and it's probably better done than most. Still, I was not tempted to part with my money despite the charms of the packaging. I'm holding out hope for a livelier flanker, or that maybe Balenciaga will adopt that design as the house bottle? If they put Balenciaga Paris in that bottle, I think I'd be forced to reach for my wallet. 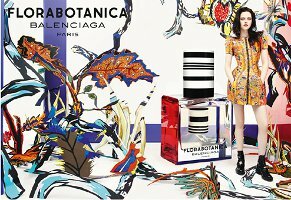 Balenciaga Florabotanica is available in 30 ($65), 50 ($95) and 100 ($125) ml Eau de Parfum. 1. See the "behind the scenes" video. Interesting review, Robin. It was a nice way to finish off lunch. I agree with you re: the bottle and ad design – very fun and interesting. But color me a cynic – I have zero expectations anymore from these perfume houses. When Wasser at Guerlain does away with the Guerlainade and dumps vats of the dreaded white musk into new releases, I’m done. Bleh! I know most perfumistas hold the modern house of Guerlain in much greater esteem than I do, so I’ll keep my mouth mostly shut (you know I can’t ever shut up entirely!) and just say that I don’t see any great difference under Wasser than what happened immediately before. When it comes to it, if we’re just talking widely distributed pillar scents (and not smaller niche efforts), I liked Balenciaga Paris better than anything Guerlain has done since I started blogging. Oh Robin, not even attrape-coeur? As much as I mostly despise Wasser’s oeuvre @ Guerlain, Balenciaga Paris was so limp and pale that I can’t see it beating the worst aqua allegoria! Yeah, I know, de gustibus! By the way has anyone tried this year’s shalimar ode à la vanille (from Madagascar, no less!)? Gorgeus and marvelous and wonderful. I will go full bottle! But that is a 1999 scent — I don’t think it makes sense to compare it to what Wasser is doing now! He’s really only done 2 pillars, Guerlain Homme & Idylle, and they’re as good as Insolence or L’Instant, IMHO. Adding — but also true that clearly I liked Balenciaga Paris better than you did — I do like (and sometimes buy!) a few Aqua Allegorias, but don’t consider them as serious fragrance efforts, so to speak. I much prefer la petite robe noire to Paris, but I confess I find Idylle hideous, and don’t care for Guerlain homme. I’ll go check the birthdate and nose of l’instant pour homme, which I love more than any of the uber expensive l’art et la matière fragrances, and even more than a few Guerlain classics. LOL the Aquas are the best things Wasser has done lately, maybe they should tell him the brief for their next big release is just an Aqua and let him go to town! Agree L’Instant Pour Homme was good — I think better than L’Instant. It was 2004. Zazie, did you find this year’s Ode a la Vanille noticeably different that last year’s? Hi Lys! I don’t have the previous version at hand to compare, but if my memory serves me well I think last year the opening was smoother but the dry down less interesting and I didn’t feel like buying it; this year’s version is rich like an older bottle of parfum I love, more dessert-like but with enough of a dark streak to drive me nuts!… I would love to see reviews on line to check if it’s my taste that has changed, or if the new one *is* different! Thank you, that’s helpful. I thought the last one was pretty smooth too and linear, I wanted it a little rougher so if this new one has a darker aspect then it’s worth trying. I’m always hoping one of the Shalimars will work for me. I’m a long time reader of this blog, just new to posting. I was wondering where I could purchase this version of Shalimar Ode de Vanille? It sounds like I would love it. Ismellpretty, welcome! Sephora in France has it, not sure it is at US dept stores yet, but Neiman Marcus is almost sure to get it eventually, and I would think Saks too. I don’t think I can argue, Robin. The only Guerlains I’ve liked since Wasser’s installment are either Les Parisiennes (Iris Ganache – I know this is too gourmand for you), and some of the L’Art et la Matiere (Angelique Noir and Bois d’Armenie). Unlike others, I am also a fan of some of JPG’s later creations: Mahora, Philtre d’Amour, (and Attrape Coeur regardless of who gets credit) etc. But without looking, I can’t remember their release dates. But again, not “pillar fragrances”. Was not meaning I didn’t like anything from Guerlain! Or that I didn’t like the brand. Just meant that the incredibly high esteem they are held in makes little sense to me…I think if some other brand had put out the fragrances that Guerlain has made since 2000, they would be popular w/ perfumistas, perhaps, but would hardly rate the veneration that is awarded to Guerlain. I see no great “sea change” since Wasser took over, it’s still a decent but not all that exciting pillar every few years, a mix of “niche-ish” limited distribution kind of things (some great, some good, some a waste of time), a decent Aqua Allegoria now & again. And that makes sense, since the creative direction has been under Sylvaine Delacourte for some years (I think 2002? I’m not sure). Now if *she* retires, I would expect things to possibly change. I was given a sample of it a couple of weeks ago and I pretty much agree with you, Robin. I found it dull, duller than BP and, while BP wasn’t exactly super-exciting, it was perfectly pleasant. I can’t even say that much for Florabotanica, it’s just…blah. Such fun packaging and the supposedly edgy actress make for a strange fit for juice that’s completely devoid of any personality. Is she edgy? Gosh, you really can’t tell from that Balenciaga video. I didn’t think they should have used that footage, she just mostly sounds out of her depth. Will be really interesting to see if it sells — I assume it’s going to be more widely available soon (I think in the US it’s still just at Neiman Marcus?) and we’ll see more reviews. When I got my sample it was exclusive to Harvey Nics here in UK and there didn’t seem to be that much interest in it so I got SA’s undivided attention. That said, I think it’s inoffensive enough to sell quite well. Possibly, but there’s so much inoffensive stuff now — maybe it will be enough, but maybe not! Thanks for your review. I like the bottle design and am curious to see it in person. I understand some people hated the design, but I think it’s fabulous. Love the packaging. Shame that the juice doesn’t live up to it. Especially after Balenciaga Paris raised my hopes–it’s such a beauty! So sad to hear this cause that packaging is ADORABLE!!! I’m exactly the target audience for this fragrance which is NEVER the case. I love the bottle, love the print ads, love the video with that Kills song, love (well, like) Kristen Stewart. As in, along with Keira Knightly, I find myself more tempted to buy an Elle if it features Kristen Stewart on the cover (Katy Perry has the opposite effect on me). I intellectually understand that Paris is a good fragrance but it personally bores me; L’Essence, slighly less boring? This new one, I really like it. I like that it’s 1) a rose I can wear that isn’t old-fashioned or insipid; 2) goes well with skin while maintaining a distinctive shape to its sizable sillage. I must be lucky b/c I got a lot of herbal vetiver thru my wearing, with the shape of the perfume intact and radiant for hours. The drydown was good too, so sweet, rosey and ambery. A lot of mainstream stuff gets sour or chemical the next day. This didn’t at all. I have not bought it, so that shows I’m not smitten, but as a mainstream release, even without the divine “targeted” packaging – which actually set me up to expect a letdown – it’s one of the best I’ve tried this year. It also smells “interesting” rather than just pretty, at least on me. Miles better than other modern roses like Chloe L’Eau or Stella or whatever. Agree BP was not ‘exciting’, just think it is a really great scent on other grounds. But so glad to hear someone loves this one, and someone in the target market to boot. I would love it if brands like balenciaga and givenchy (whose designers are such brilliant, original, talented visionaries) would do small, boutique-only scents in addition to their big releases. I get that for the most part they sell handbags and perfume, and their high fashion creations are kept afloat by this more mass-oriented stuff. But they should pay attention to us perfumistas and give us some scents that are as amazing as the clothes they show on the runway! On the one hand, I hear you, on the other, the fewer releases every year, the better, at least so far as I’m concerned. The market is saturated at all price levels. Bottega Veneta managed to make a great mainstream scent which also pleased many perfumistas so, imo, Balenciaga et al have no excuse. I adore the bottle and the box. Oh, well, one less lemming for me! Give it a shot though, you might love it! Oh no. I adore the bottle and the outer box and was liking the idea of a strange garden with some decent sounding notes. And I love Balenciaga Paris! I’m too old for the target market but think its rubbish anyway as I wear what I like and I would have liked to have liked and worn this. Onward and upward, I smell like Ormonde Jayne Woman today so all is right with the world. Plus my 3 1/2 year old daughter told me I smell like a forest princess! “Forest princess” – I love that! Your daughter is one smart lady! Oh my gosh! “Forest princess” must be the best compliment EVER! I saw this at Neiman Marcus on Saturday on Saturday and completely agree with you that the bottle is great, really wonderful in person. They were handing out attractive scented cards (to the left of your bottle pic). I didn’t try it on skin but I thought on paper it was a lot more interesting than I expected. And it’s NOT sweet and fruity! I think it’s amazing that Balenciaga has made a scent targeted to young women that is not sweet and fruity. The musk tends to drown out other notes, though, but maybe I’m hyperosmic to it, as usual. Agree that it’s nice that it isn’t sweet & fruity, and maybe you’ll find it more interesting than I did on skin, who knows? I did not hate it, I just didn’t care about it. I am about to go to the airport for my yearly visit to the States, and Florabotanica was on my “try list”. Let’s say that now it is not that prominently up on the list. Will coment upon my return if I try some new stuff on the duty free shop… but let me tell you , the duty free shops are NOT what they used to.. since the economy crashed in 08, they have nor recovered IMHO! Hey, never hurts to try though, right? Hope you have a great trip in any case, and smell some wonderful new scents! Ok, this bottle had better win ALL the awards for packaging because I absolutely LOVE it! I FINALLY saw it in person today! I grabbed it and never wanted to let it go. It was very sad when I had to walk away from it. Haha! Why, oh why don’t I LOVE the scent more?! Would it be the absolutely worst thing in the world if I bought it just for the bottle?! I NEED to avoid the bottle at all costs when I visit my Nordstrom. I WANT IT! BAD! I purchased Florabotanica the same day I had been huffing Thierry Mugler flankers. I purchased Alien Essence Absolue also. I think maybe my olfactory system was on overload and perhaps Florabotanica was like the sorbet course between the heavier offerings from TM!